Most of the bloggers want more backlinks to their blogs because all of them want to attract huge number of regular visitors and subscribers. This is one of the best SEO practices as gradually those blogs will get more and more traffic. It increases your blog's page ranking in search engines making your blog more visible and quick searchable on SERPs. There are various organic or natural ways to build backlinks. But while building links, you need to take care of some guidelines. Regularly submit your article to the article directories like - Ezinearticles.com, GoArticles.com, ArticlesBase.com, ArticleCity.com, Amazines.com, ArticleTrader.com etc. By submitting to these higher PR sites you can ensure your quality of writing as well as getting more readers for your blog. Always visit blogs which follow same niche and cover similar topics. These articles will add aditional value to your knowledge base which can be expressed in your own way. While reading other blogs' posts, you may comment on them ensuring inreaction with other fellow bloggers and take a view or idea from those comments and replies and later on you can make use of it. make sure that you are not doing any SPAMMING business here. Make your comment box available for people so that you can also interact with them and making sure to get a returning visitor to your site. You may use such Web 2.0 websites like Hubpages, Squidoo to get large number of viewers as these sites are already having indexed pages with higher page ranking in SERPs and have large number of viewers and connections with different websites of similar niche. Select some good sites within your niche and start posting as a guest author. It will make you known to other blog's viewers and in this way you can promote your blog too. Start writing on a forum and take participation in Q&A online communities. This will increase your understanding on the topics and will clear your views ensuring leaving your blog link there in relavant and related topic. Participate in the blog carnivals which have targeted audience and there is a scope for you to get few percentage of that massive audience to your blog. If your blog niche comes under technology and you provide how-to guides. Start making your own how-to guides' videos also so that people who will watch the videos on online video websites like Youtube, will come to your blog too. This is one of the best techniques to bring traffic to your blog. Organize Giveaway Contest/Quiz very often ensuring the visitors are taking part on the Giveaway contest and quiz. Obviously this is the most vital rule in the field of blogging. Until & unless you write quality and unique content, you won't get visitors. Readers will be attracted to the posts which are unique and original which will be having good quality and full information. You can go for a good catchy domain name and start blogging. Don't buy backlinks and get your site linked. There are a lot of software for backlinks builder available over net but stay away of them. In SERPs, links found via link exchange communities will be considered as fake and will not encourage your blog for good page ranks. Good article submission service will help your blog to grow fast by increasing readers and subscribers but if it submits to cheap and junk directories? Don's make sense. So, be selective before you submit article. Bloggers do think that it is necessary to post everyday without fail. Yes, it is a good practice that you write at least one article every day but it doesn't mean that you should look for quantities rather than quality. Posting degraded quality contents will reduce the number of viewers. Engaging with online communities doesn't mean that you write anything irrelevant to the topic itself. This useless comments and links will not bring any visitors to your site. Search engines consider these links as spams. 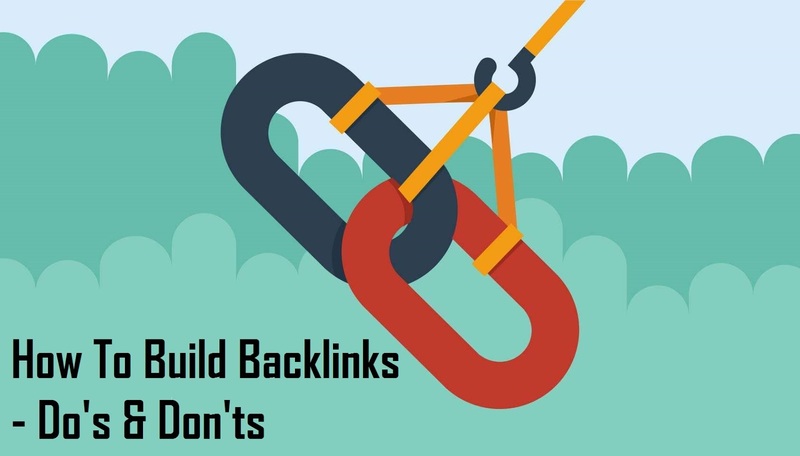 We have discussed about the DOs and DON'Ts while you build backlinks ensuring a good SEO practice on your blogs/websites for better ranking in SERPs.